Webster University Vice President for Advancement Charles Hahn has been named to the position of Vice President for Alumni and Development at Millikin University in Decatur, Illinois. His new role will begin in February of 2017. Hahn joined Webster University in June of 2014 and served on the administrative council, while working closely with the president, provost and the board of trustees. Hahn was responsible for reorganizing the Advancement staff and streamlining operations, while showing significant results. Hahn and his team in Advancement greatly expanded scholarships for students. Last year, the total of donor funded annual and endowed scholarships was $847,000. For this academic year, that number has soared to $1.2 million, a 40 percent increase and the highest annual total for student scholarships ever at the University. Hahn also guided endowed scholarship fundraising connected to the University’s Centennial Celebration, raising $1.2 million for the newly created Webster University Next Century Leaders Scholarship Fund in 2015-2016, the largest initial donation to an endowed scholarship fund in the University’s history. Also, Hahn and his team worked to improve commitments to gift-giving to the University: in his first year, commitments stood at $3 million and during the 2015-2016 fiscal year those commitments had improved to $7.1 million. Under Hahn’s leadership, external grant funding improved at the University and stands at $2.2 million this academic year, an increase of $1.7 million during Hahn’s service to the University community. Under his guidance, the university’s annual fundraising gala and giving societies were transformed. The Daniel Webster Society was retired as a fundraising organization and the 1915 Society and the Webster Society were created. Hahn and his team also started an electronic alumni magazine, called Webster Glimpse (websterglimpse.com). Hahn was also responsible for connecting alumni to the University in stronger ways that will allow for an improved culture of gift giving to the University in the future. 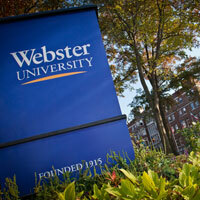 Hahn will be with Webster University through the end of January.